Batum a last minute addition to France? For all the talk of France’s NBA veterans skipping the Olympic Qualifying Tournament in Manila, they still have enough to mount a challenge for one of the last three slots to the Rio Summer Olympics. Nicolas Batum, the Charlotte Hornets’ guard is now in training camp for head coach Vincent Collet’s squad in Pau, a city in southwest France bordering the Pyrenees mountains with neighbouring Spain. France’s camp, that opened in June 10, is happy that Batum is present although he is just limited to drills and workouts while avoiding scrimmages. There is concern if his paperwork will get done in time for him to board a plane to Manila as he is currently in negotiations with his NBA club. It is those same contractual wrangling that has eliminated Rudy Gobert, Evan Fournier, and Ian Mahinmi from participation. How important is Batum? The six-foot-eight forward was named France’s Best Player during the FIBA World Cup in Spain in 2014. Without Gobert, Les Bleus’ inside presence, Collet will turn to seven-foot-one center Alexis Ajinca to man the slot. Ajinca was in uniform when France won EuroBasket 2013. He currently plays for the New Orleans Pelicans in the NBA. Aside from NBA veterans Tony Parker, Boris Diaw, Florent Pietrus, France will count of Nando De Colo who is tabbed to be their future leader. The 28-yerar old shooting guard suits up for CSKA Moscow in the VTB United League in Russia. The aggressive De Colo who was Parker’s teammate in San Antonio from 2012-14 and who also suited up for the Toronto Raptors in 2014, was recently named Euroleague Final Four Most Valuable Player. He averaged 18.9 points a game for CSKA Moscow. As part of France’s preparation, they are playing some tune up matches at Pau’s Palais des Sports. Les Bleus takes on Latvia on June 16, Serbia at the AccorHotels Arena in Paris on June 21 and in Belgrade on June 25 before facing Japan back home, this time in Rouen on June 28. That will be their last friendly match before flying in to Manila. France is bracketed with the Philippines and New Zealand in Group B. They take on the host nation on June 5 then the Tall Blacks on June 7. 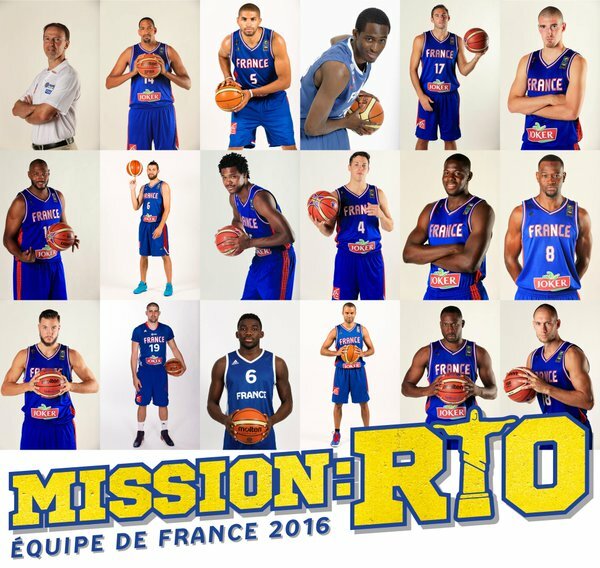 France 17-player preliminary squad for 2016 FIBA Olympic Qualifying Tournament (OQT) in Manila: Alexis Ajinca, Nicolas Batum, Rodrigue Beaubois, Fabien Causeur, Nando De Colo, Boris Diaw, Antoine Diot, Mickael Gelabale, Thomas Heurtel, Mouhammadou Jaiteh, Charles Kahudi, Joffrey Lauvergne, Adrien Moerman, Yakuba Ouattara, Tony Parker, Florent Pietrus and Kim Tillie.